Bill Powers, the founder of Badger Mountain Vineyard and Powers Winery in Kennewick was recognized as one of the 2010 Legends of Washington Wine. 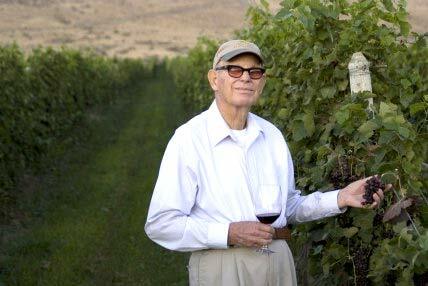 Bill Powers was named a “Legends of Washington Wine” in 2010 and inducted into the Legends of Washington Wine Hall of Fame. He supplies our Badger Mountain Vineyard wines. Bill Powers planted his Badger Mountain Vineyard in 1982 after consulting with Dr. Walter Clore and, in the late 80s, began exploring the possibilities for low-impact and organic viticulture. He set out to convert to organic practices in 1988, and in 1990, Badger Mountain Vineyard was the first vinifera vineyard to be certified organic by the Washington State Department of Ag. Powers was nominated as an “organic pioneer” and growers interested in reducing or eliminating conventional input continue to seek his wisdom guidance on the subject. Powers’ innovative techniques have helped Washington State move forward to lower input, sustainable, organic-based viticulture. Powers also led Badger Mountain and Powers Winery to become one of the state’s top producing brands while guiding the second and third generation Powers toward future leadership. His latest venture has put solar energy and bio-diesel conversion into the business plan for Badger Mountain. Powers was one of the original members of the Washington Association of Wine Grape Growers and, in 1996, was selected as “Grower of the Year” by his colleagues. Powers received the WAWGG “Lifetime Achievement Award” for his industry work in 2007. Read more about Bill Powers here. Read more about the Legends of Washington Wine here.